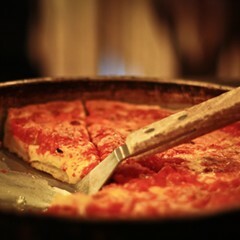 Original location of a popular family-run chain specializing in genuine Chicago-style deep-dish pizza. The room hasn't changed since this original location opened in 1971. Sports posters, photos, and paraphernalia cover the walls, red-checked vinyl tops the tables, and cozy booths line the walls. 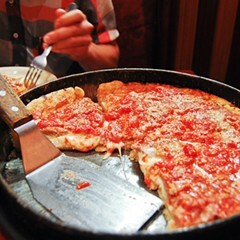 Locals still pack in (and carry out partially frozen or fully cooked pies -- no delivery at this location) for the addictive deep-dish and thin-crust pizzas. Service is always quick and cordial, but calling in your order before arriving speeds up the process.